Students in middle and high school spent the summer learning about social responsibility and human rights as part of the CATALYST Literacy and Leadership Academy. 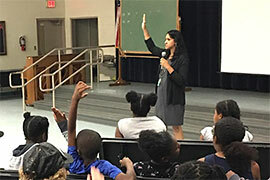 Rajni Shankar-Brown, Ph.D., Stetson associate professor and the Jessie Ball duPont chair of Social Justice Education, has just completed one busy summer. In addition to working on publications and presenting around the globe, during much of June and July Shankar-Brown was working throughout Volusia County, on the doorsteps of Stetson’s DeLand campus. 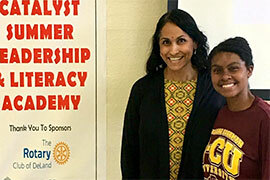 Shankar-Brown facilitated educational workshops on social responsibility and human rights for middle and high school students participating in the CATALYST Literacy and Leadership Academy. CATALYST stands for Children and Adults Together Achieving Leadership, Inspiration, Success and Trust, a program founded by Dr. Felicia Benzo in 2010, following decades of practicing medicine. The majority of scholars in the program are students of color, and many are from low-income or distressed families. Today, with the assistance of several community sponsors, the program is active in 28 Volusia public schools — with Shankar-Brown playing a vital role. 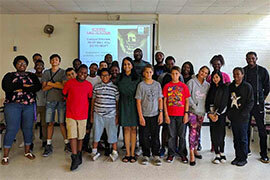 Shankar-Brown worked with more than 100 students in grades 6-12 at the Deltona and Southwestern middle school academy sites, with a few of the students also part of Hatters University, which was founded and directed at Stetson by Shankar-Brown. (See Stetson Today article.) She designed and facilitated workshop learning on intersectional issues connected to poverty from multidisciplinary perspectives, encouraging the students to ask critical questions and understand the complexities of poverty and the intersection of justice issues. Other topics included connections to implicit bias, structural discrimination, educational disparities, racism, gender and sexuality, mass incarceration, and healthcare inequities (especially regarding the environment). Additionally, she bridged history and human rights, revealing the persistence and unfortunate rise of homelessness in the United States, particularly in Central Florida. Also as part of her presentations, Shankar-Brown shared personal stories, including her family’s journey from poverty and homelessness, and offered insights from her work as a scholar-educator and board member of the National Coalition for the Homeless. The nonprofit organization is the leading voice in the federal legislative process to prevent and end homelessness and ensure that the immediate needs of those experiencing homelessness are met and their civil rights protected. A pledge by students turned into the Volusia Hunger Project. In the end, Shankar-Brown’s challenge to the students was to help address poverty, hunger and homelessness across their community. Their initial response turned into the Volusia Hunger Project. Collectively, students facilitated a food drive, also collecting school supplies and hygiene items. Students made flyers about community resources to attach to the supply bags for distribution throughout the county, and included handwritten positive affirmations and uplifting images in each bag. Also, students developed a project as part of their Volusia Hunger Project to help homeless students in low-income schools, called EATS Healthy — an acronym for Encouraging All to Snack Healthy — addressing food insecurity and children’s self-esteem. “The students met the challenge, and Dr. Shankar-Brown is their inspiration!” commented Benzo, executive director of the nonprofit CATALYST Global Youth Initiative Inc.
Brittany Woods, site supervisor for the Academy at Southwestern Middle School, became involved with CATALYST in 2016. Woods faced many economic challenges growing up, which included putting herself through college despite unstable living conditions such as couch surfing to survive. Today, she’s pursuing a master’s degree in industrial engineering at the University of Central Florida. Melissa Reeves, site supervisor for the Academy at Deltona Middle, wholeheartedly agreed. Further, Shankar-Brown worked with students from Stetson University and nearby Bethune-Cookman University, who were serving as Youth Team Leaders for the Academy, empowering them as educational leaders and inspiring deeper civic engagement. 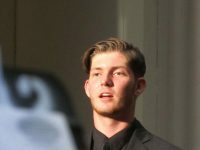 Among them was Brendan Haviland, a junior at Stetson majoring in business administration and a FOCUS leader on campus, who assisted with the workshops. 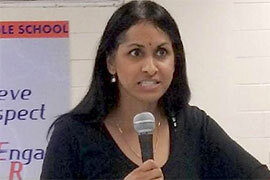 For her part, characteristically, Shankar-Brown was grateful and excited. Notably, there was the opportunity to share the efforts with her son and daughter, Valen and Romila, who both are student ambassadors for the cause. Mostly, there was another chance for positive impact on many children’s lives and to help build healthier communities. “I am incredibly proud of the CATALYST scholars — for not only wrestling with complex issues and accepting my social responsibility challenge this summer, but for being resourceful and working together to mindfully help address poverty, hunger and homelessness in our community,” said Shankar-Brown, the 2018 Phi Delta Kappa International Florida Educator of the Year and the 2016 Florida Campus Compact Engaged Scholarship Faculty Award recipient. “I believe children and youth are instrumental in advancing equity and justice. They are filled with immense potential and promise. And in a world with persistent inequalities, we need to support future generations in unlocking their full potential and encourage them to become positive ‘solutionaries’ and agents of change. The Volusia Hunger Project developed by our youth is already having a visible impact. We must continue to collectively forge pathways for transformative and sustainable social change.